A specially designed gift box with a window contains 24 pieces of 5g chocolate bars. 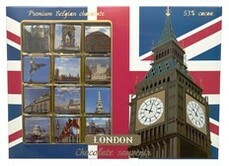 Each chocolate piece has a different picture of a London sight printed on the wrapper. The total chocolate weight is 120 g. Tasty Belgian dark chocolate (cacao 53% minimum).